Max Factor Gel Shine Lacquers: Super Shiny One Coat Wonders! People! 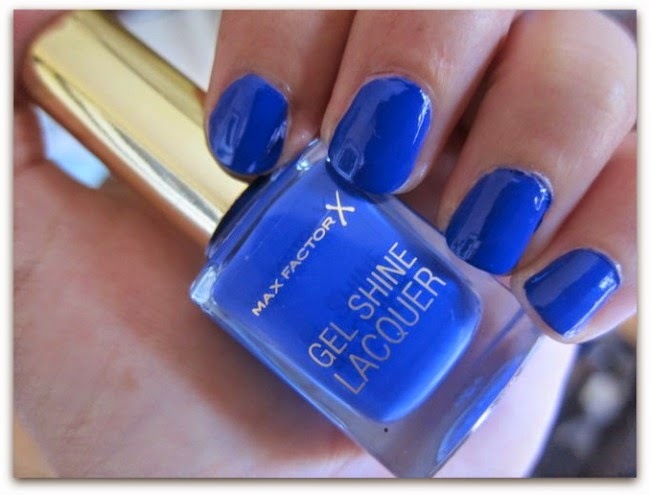 This is ONE COAT of Max Factor’s new Gel Shine Lacquer in Glazed Cobalt. One! And there’s not a lick of top coat either: that blingin’ shine is all this baby’s work. I am AGHAST, now, at how long it’s taken me to get these newbies on my fingers – and the hours of nail painting drudgery I’ve pointlessly endured. One coat! ONE! COAT! Ok, ok, you’ve got it, what else do I need to tell you? Let’s start with shades: there’s nine in total, inspired by different decades, and they’re lovely; this is the one that jumped out at me from the start. But there’s a lively orangey red, called Patent Poppy, that I have a date with soon, plus a green, orange, purple…heck, just check ‘em all out here. At €10.39, the price is pretty palatable, and the formula’s a dream: this slicked on nice and smooth for a vibrant, high-shine, geniunely gel-effect type look. Any downsides? Well, it didn’t last the promised 7 days, but I’m hard on my nails, and also, hello, no topcoat. So while it doesn’t need it for the shine, next time I’ll lash on some Seche Vite just to help it last. What do you reckon, will you be trying these out?